Yes, it is that time of year, again! So, I wanted a desktop wallpaper for Christmas holiday. I searched the internet and found many beautiful wallpapers and while searching I got inspired to make one myself. This is the result, initially I wanted to make a tutorial also but I didn't have enough time because I am working on several other tutorials at the moment. 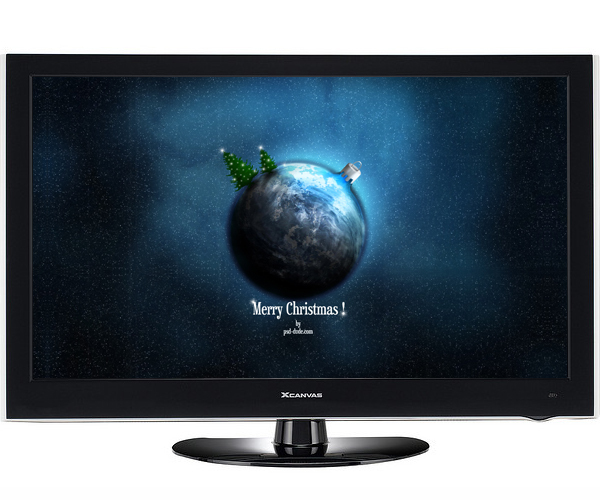 The Christmas Wallpaper is free for download, hope you like it! A year has passed since I first published this wallpaper and you can now read the Photoshop tutorial on how this Christmas photo manipulation was made. There are a few differences between the two versions, the updated one being so much better so you might take a look. Even though I didn't make a tutorial for how I made this wallpaper, I still want to give credits to the stock images/brushes owners that I have used: stars by aajohan, Planet Alaerin by stock7000, Christmas Tree Brushes by markyfan and Pixie Dust Trails Brushes by rl-brushes. You can also download this wallpaper for your iPhone and iPad. 6 comment(s) for "Xmas Space Theme Wallpaper for Your Desktop"
Hi, i want to ask you a favor. Because this is my first wallpaper i don't know how it looks on different desktop sizes, maybe you could tell me!